The beauty of Capri is that all it takes is a few moments walk from the festive crowds in the Piazzetta to find yourself once again surrounded by the island's lush serenity, and just a few short meters separate luxury shop windows from uncontaminated nature. Via Tragara is one of Capri's most picturesque lanes, which begins with a short but steep climb at the end of the famous boutique-lined Via Camerelle. 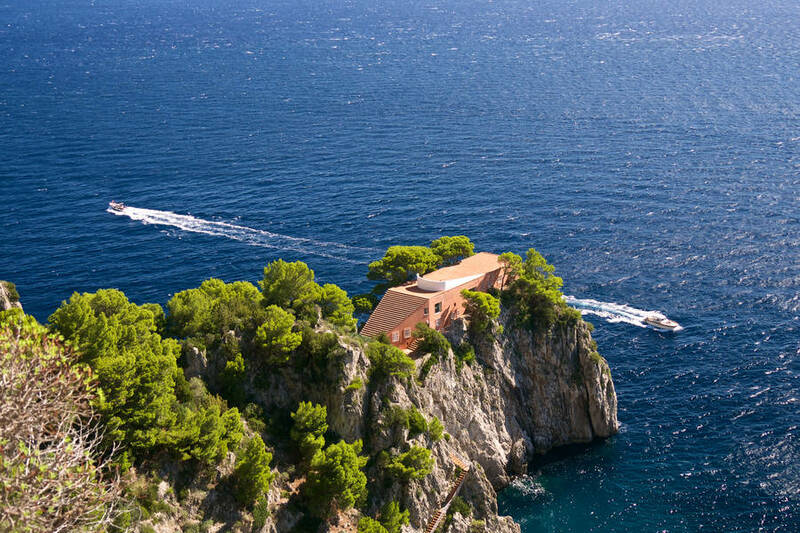 The lane winds past luxury hotels and villas, hidden behind imposing gates and hedges, and treats walkers to glimpses of the shimmering sea through colorful flowering flora and pine groves. The Chiesa Evangelica Tedesca is at the beginning of the street, looking like a Alpine church magically transported to this Mediterranean isle. 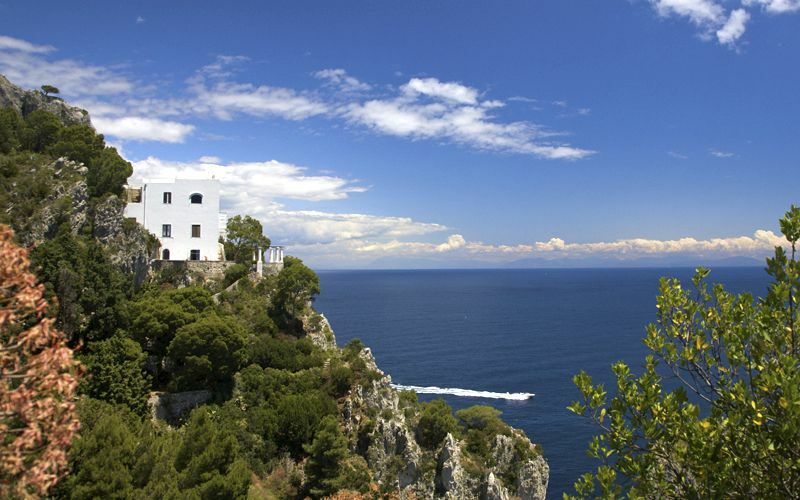 Further on, you pass Villa Discopoli, where Rainer Maria Rilke once stayed, and Villa Lo Studio, home to Pablo Neruda during his time on Capri. 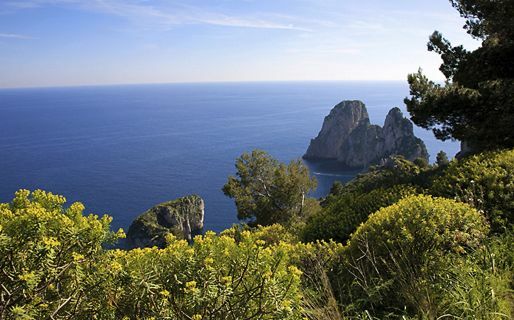 Via Tragara ends at a spectacular scenic overlook facing the Faraglioni rock formations and Marina Piccola. 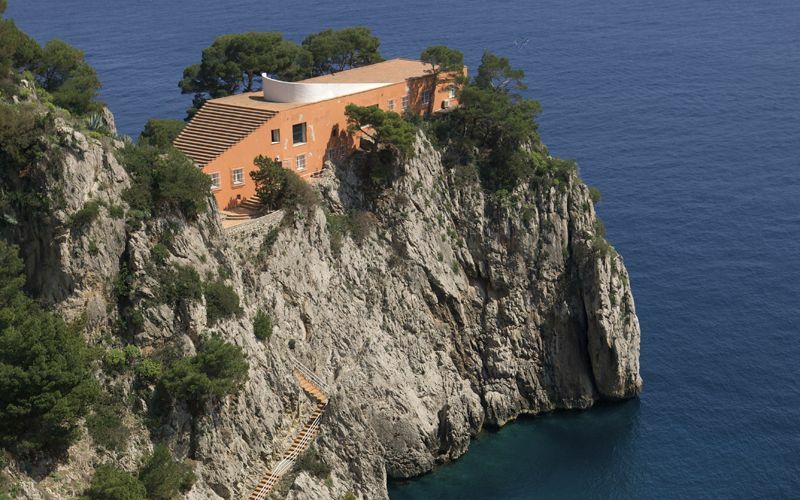 Nearby, the Hotel Punta Tragara was in part designed by Le Corbusier. 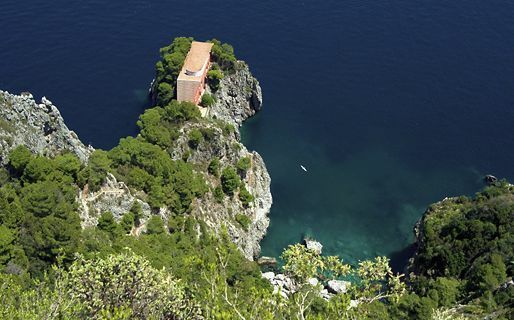 From the Belvedere di Tragara scenic overlook, the Pizzolungo trail continues on, which traces the coastline to the Arco Naturale stone archway, with views over the Faraglioni rock formations and Punta Masullo, where Curzio Malaparte built his sumptuous villa. We generally recommend beginning this walk from the area near Matermania so you won't have to finish up with a long stretch of stairs uphill, just when you are starting to tire! 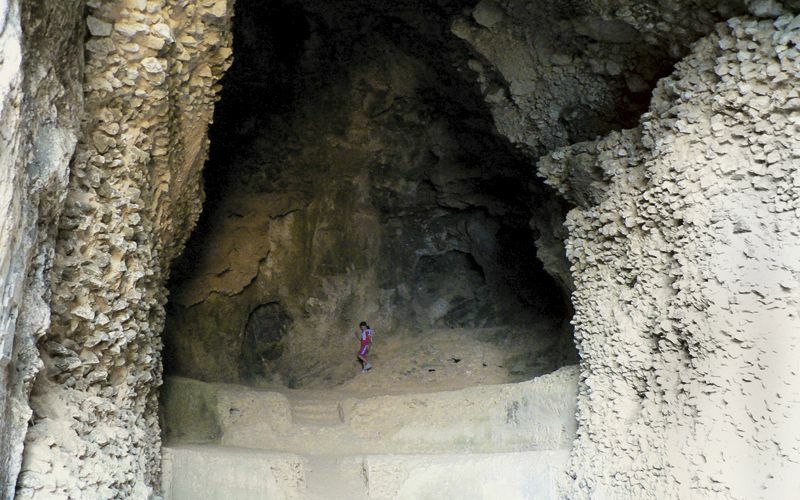 The route ends at a staircase leading to the Matermania cave, dedicated in ancient times to the god Mitra. Continuing on, you reach the Arco Naturale stone archway. The Arco Naturale, or Natural Arch, is a Paleolithic rock formation about 12 meters wide and 20 meters high that was formed by millenia of erosion and geologic processes which gradually created its unique arch formation. 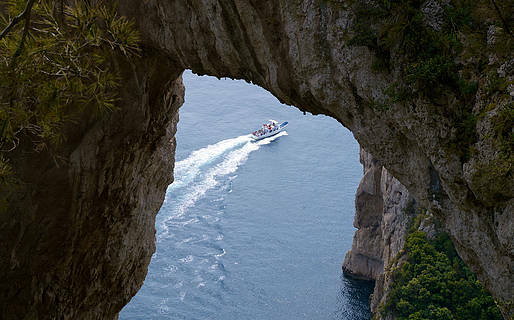 From the small square facing the arch, there are views over the Sorrentine Penisola, especially Punta Campanella, and the islets of the Li Galli archipelago. 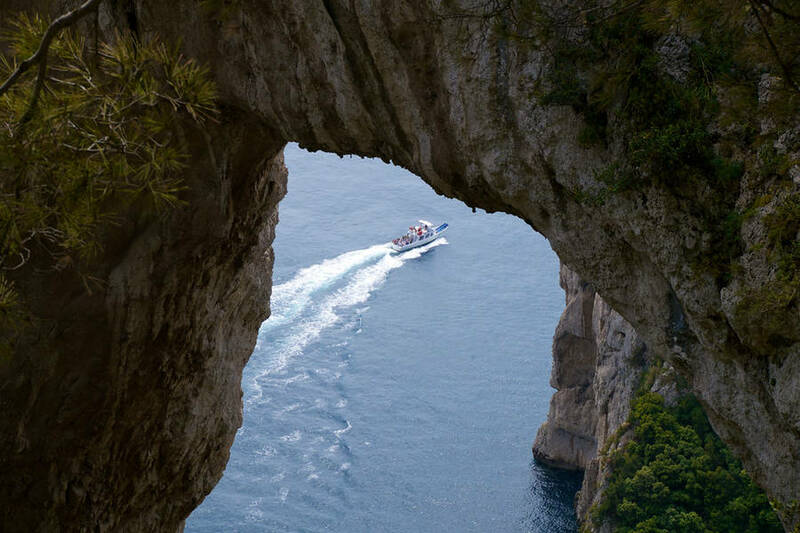 Along the route, there are a number of scenic overlooks which let you enjoy the view from directly under the stone formation; or you can enjoy views of the Natural Arch from the sea. 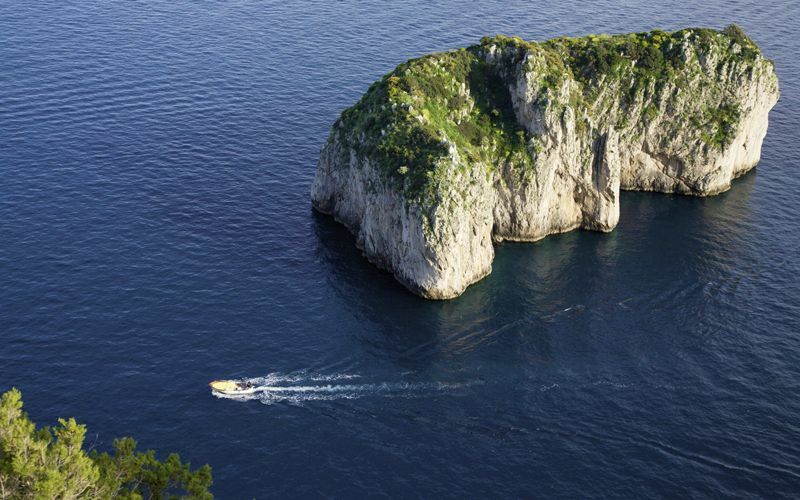 If you take a boat tour of the island, ask your skipper to stop for a minute off the coast and point it out! 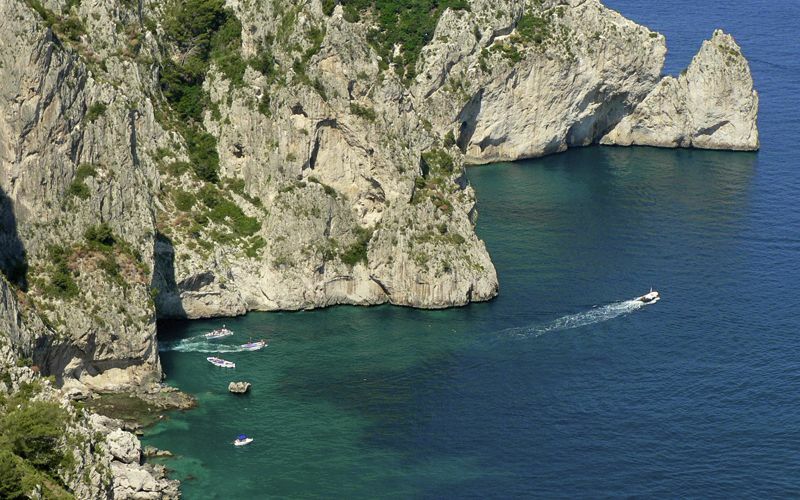 Free to the Public: there is no charge to visit the "Arco Naturale". Opening Hours: the area is open all year round and all day long. From here, you can return to the Piazzetta along Via Sopramonte and Via Longano.